VIDEO - adidas: Leo Messi - Director of Boot Sales! 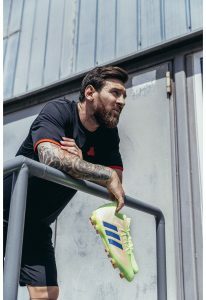 Home / International Football / Worldwide / VIDEO – adidas: Leo Messi – Director of Boot Sales! VIDEO – adidas: Leo Messi – Director of Boot Sales! adidas has launched the Exhibit Pack; an updated series of colourways for the brand’s most legendary silhouettes. The collection includes striking new versions of the Predator19+, COPA 19+, NEMEZIZ 18+ 360 AGILITY and X18+ silos, designed to fit the preferences of players everywhere. The new Exhibit Pack Nemeziz. Previous FC Barcelona make shock Kevin-Prince Boateng on loan signing! Next AXION energy is River Plate’s new official sponsor!